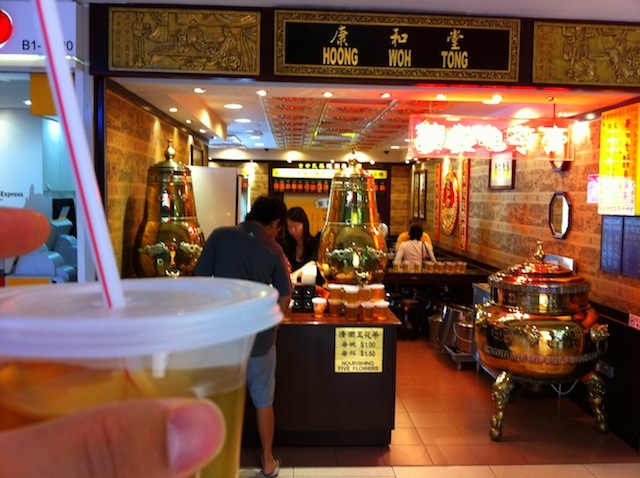 Located inside the Parkway Parade shopping centre on Singapore’s East Coast, Hoong Woh Tong is a franchise chain Chinese herbal drink shop (in both Singapore and Malaysia). They sell traditional Chinese herbal jelly called Gui Ling Gao, served in a small bowl with honey or sugar syrup. You can either order it hot or chilled, and this jelly helps to “reduce body heat, and is good for skin’s complexion”. Their two types of leong cha or herbal tea are Five Flower Tea for “soothing and nourishing the body” and Wong Lo Kat for “relieving body heat and removing toxins” (to combat yeet-hay!). We tried the sweet five flower tea on that hot and humid Singapore afternoon – it was super refreshing!